Software Studies Initiative: GamePlotBranching | Tracing Variable Experience in "Knights of the Old Republic"
GamePlotBranching | Tracing Variable Experience in "Knights of the Old Republic"
In this exploration of how plot branching designs function (and fail) in games, Noah Wardrip-Fruin first identified a failure in the plot branching structure of the Xbox console video game "Knights of the Old Republic." Under Wardrip-Fruin's guidance, undergraduate researcher Colin Wheelock used the PlayDVR gameplay recording station to record over 40 hours of gameplay, exploring how the plot worked and identifying the conditions under which it failed and creating video excerpts to trace this process. 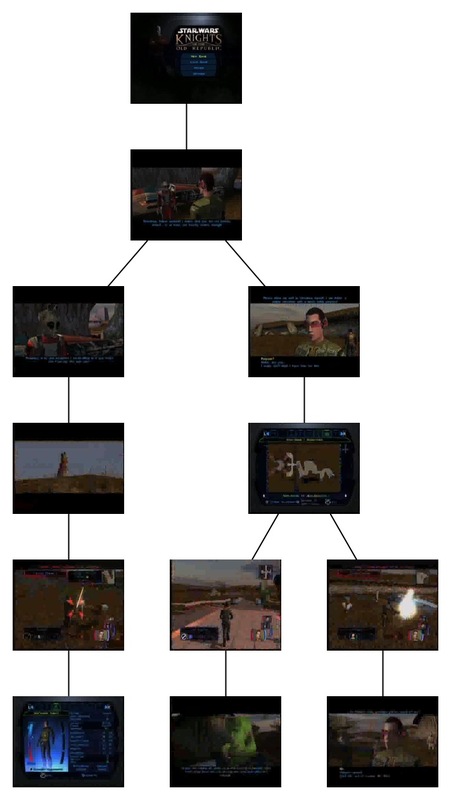 The project includes the development of new novel representations of branching conditions for use in articles and academic presentations about games.